Charles Jay Connick (1875–1945) was a prominent American painter, muralist, and designer best known for his work in stained glass in the Gothic Revival style. Born in Springboro, Pennsylvania, Connick eventually settled in the Boston area where he opened his studio in 1913. Connick's work is contained in many preeminent churches and chapels, including examples in Boston, Chicago, Detroit, New York City, Pittsburgh, San Francisco, Seattle, and Washington, D.C. He also authored the book Adventures in Light and Color in 1937. Connick's studio continued to operate, and remained a leading producer of stained glass, until 1986. Born in Springboro in Crawford County, Pennsylvania on September 27, 1875, Connick moved with his family to Pittsburgh when he was eight years old. Bullied by city children who made fun of his countrified attire, Connick would stay indoors during recess and draw with crayons, and thereby developed an interest in drawing and color at a young age. When obligated to leave high school when his father was disabled, he became an illustrator on the staff of the Pittsburgh Press. At the age of 19, Connick became apprenticed in the production of stained glass windows at the shop of Rudy Brothers in Pittsburgh, where he stayed through 1899. He left for work in Boston for two years, returning to Pittsburgh in 1903 and worked for a number of stained-glass companies both in Pittsburgh and New York. Connick also studied drawing and painting in night classes and went to England and France to study ancient and modern stained glass, including those in the Chartres Cathedral, in which he examined the effect of light and optics that had been employed in the 12th and 13th centuries, but which he perceived to be neglected since. Connick was also influenced by English Arts and Crafts Movement stained glass artist Christopher Whall. Connick's first major work, the First Baptist Church in Pittsburgh, was completed in 1912. Connick settled in Boston where he opened his stained glass studio at Nine Harcourt Street, Back Bay, Boston in 1913. 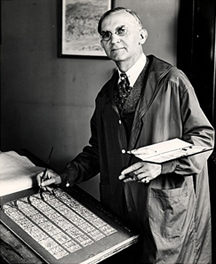 From there until his death, Connick designed and produced many notable stained glass windows including the rose windows of the Cathedrals of St. Patrick and St. John the Divine in New York City, and windows in the Princeton University Chapel, the American Church in Paris, and in the Calvary Episcopal and East Liberty Presbyterian churches in Pittsburgh. One of his largest works is in the Heinz Memorial Chapel at the University of Pittsburgh. Heinz Chapel has the distinction of having all of its 23 windows (4,000 square feet (370 m2)) designed by Connick, including its 73-foot (22 m) tall transept windows which are among the tallest such windows in the world. Connick also authored the book Adventures in Light and Color, modestly subtitled An Introduction to the Stained Glass Craft, as well as a series for Random House titled International Studio (1923–24). Connick was active in, among other societies, the Boston Art Club, Boston Architectural Club, The Mural Painters, and the Copley Society of Art. Connick adopted the Pegasus as his symbol and designed it in stained glass which was carved on his gravestone. Connick preferred to use clear "antique" glass, similar to that of the Middle Ages and praised this type of glass as "colored radiance, with the lustre, intensity, and baffling vibrant quality of dancing lights." 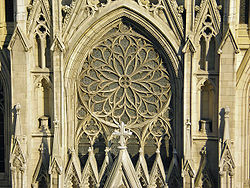 He employed a technique of "staggered" solder-joints in his leading and bars, which English stained-glass historian Peter Cormack says gives the windows their "syncopated or 'swinging' character." His style incorporated a strong interest in symbolism as well. Connick expressed the opinion that the first job of stained glass was to serve the architectural effect, and he believed that his greatest contribution to glasswork was "rescuing it from the abysmal depth of opalescent picture windows" of the sort popularized by Louis Comfort Tiffany and John La Farge. Although firmly committed to a regenerated handicraft tradition, Connick welcomed innovation and experimentation in design and technique among his co-workers at his studio. In many respects, Connick's Boston studio was the arts and crafts ideal in that the art was produced by a community of committed craftsmen. At its height in the 1930s, forty to fifty men and women worked at the studio, which, as Connick wrote in his will, was "only incidentally a business." A reporter visiting his studio in 1931 remarked on the atmosphere of mutual respect that was present there saying "Attitude to his co-designers [is] that of one artist to another...He [Connick] originates, supervises. They elaborate." Connick left his studio and business to the craftsmen which became a cooperative after his death. For 41 years the studio continued to receive commissions and design windows in the Connick tradition. The studio closed its workshop in 1986 because the workers were aging and the modern high-rises of Copley Square threatened the light source essential to their work. The final commissioned window the studio produced was placed in All Saints Parish of Brookline, Massachusetts. Shortly after closing, the studio donated its collection of records, working drawings and related materials to the Boston Public Library. Throughout its history, the Charles J. Connick Associates Studio produced some 15,000 windows in more than 5,000 churches and public buildings. The Charles J. Connick Stained Glass Foundation, Ltd., was formed after the studio closed in 1986. Its mission is to "promote the true understanding of the glorious medium of color and light and to preserve and perpetuate the Connick tradition of stained glass." In December 2008, the foundation donated materials to the Massachusetts Institute of Technology's Rotch Library of Architecture and Planning to form the Charles J. Connick Stained Glass Foundation Collection. This collection contains photographs, slides, stained glass windows and designs, paintings, and documents related to both the foundation and the studio. MIT is currently processing the collection. The following is an incomplete list, sorted by location, of Connick stained glass works in the United States. 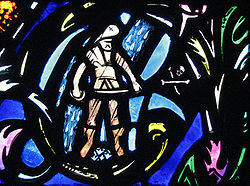 Connick's windows in Heinz Chapel contain 391 identifiable figures, and equal number men and women, from religious as well as secular history, music, science, philosophy, poetry and literature, including this pirate. ^ a b c A Thousand American Men of Mark To-day. Chicago, Illinois: American Men of Mark. 1917. pp. 72–73. Retrieved November 12, 2009. ^ a b Falk, Peter Hastings (ed.). "Who Was Who in American Art". Retrieved November 12, 2009. ^ a b c d e Donovan, Sandra Fischione (November 23, 2008). "Pittsburgh stained-glass artist's work beautifies region". Pittsburgh Tribune-Review. Archived from the original on September 13, 2012. Retrieved November 12, 2009. ^ Tannler, Albert M. (December 2008). Charles J. Connick: His Education and His Windows in and Near Pittsburgh. Pittsburgh History & Landmarks Foundation. ISBN 0-9788284-3-7. ^ a b c Tutag, Nola Huse (1987). Discovering stained glass in Detroit. Wayne State University Press. p. 150. ISBN 0-8143-1875-4. Retrieved November 12, 2009. ^ Cormack, Peter (1999). The Stained Glass Work of Christopher Whall 1849–1924. Boston Public Library and the Charles J. Connick Stained Glass Foundation. ISBN 0-89073-091-1. Archived from the original on May 12, 2008. ^ a b "History of the Connick Studio". The Charles J. Connick Stained Glass Foundation Ltd. Retrieved November 12, 2009. ^ Machamer, Barbara Diven (May 31, 2006). "Heinz Chapel Unveiled". Pop City. Pittsburgh, Pennsylvania: Issue Media Group. Archived from the original on October 10, 2017. Retrieved November 12, 2009. ^ "Louis Comfort Tiffany". Winter Park, FL: The Charles Hosmer Morse Museum of American Art. Retrieved June 28, 2011. ^ "Singing Windows". The Charles J. Connick Stained Glass Foundation. Retrieved November 12, 2009. ^ "History of the Connick Studio". The Charles J. Connick Stained Glass Foundation, Ltd. April 2011. Retrieved June 28, 2011. ^ "Join in Our Adventure in Light and Color: Connick Exhibition Being Organized". The Charles J. Connick Stained Glass Foundation. Retrieved June 28, 2011. ^ a b John Bishop (Producer/Director) (2005). The Last Window (1988) (DVD). Media Generation. ^ "The Henry Pepper Memorial Window". All Saints Parish. Retrieved January 19, 2010. ^ "The Charles J. Connick Stained Glass Foundation, Ltd". Retrieved January 21, 2010. ^ "MIT Rotch Library – Architecture and Planning: Collections". Massachusetts Institute of Technology. Retrieved January 21, 2010. ^ "Songs in Light". Pasadena, CA: Throop Unitarian Universalist Church. Retrieved April 7, 2016. ^ Lampen, Michael (2004). "Gospel in Glass". Grace Cathedral. Retrieved December 11, 2009. ^ "Parish Art & Architecture". St. Dominic's Catholic Church. Retrieved June 8, 2010. ^ "Saint John's Cathedral: History". Denver, CO: Saint John's Episcopal Cathedral. Archived from the original on July 20, 2011. Retrieved November 19, 2009. ^ Richardson, Milda B. (Summer 2008). "Gabriel's Hope" (PDF). The Charles J. Connick Stained Glass Foundation. Retrieved November 12, 2009. ^ "About Fourth Church: The Great West Window". Chicago, IL: Fourth Presbyterian Church. Retrieved November 19, 2009. ^ "The Windows of All Saints Parish". Retrieved January 5, 2009. ^ Petersen, Kristen A. (1988). Waltham Rediscovered: An Ethnic History of Waltham, Massachusetts. Portsmouth, NH: Peter E. Randall Publisher. ^ Connick, Charles J. (June 1, 1944). Work Order 2365: Designer and Worker in Stained and Leaded Glass. Nine Harcourt Street, Boston, Massachusetts: Charles J. Connick. ^ "Our Building". First Central Congregational Church. Retrieved January 21, 2019. ^ Kasparian, Lance (June 2002). "Book Review: The Stained Glass of All Saints': All Saints' Parish Church, Peterborough, New Hampshire". Connick WIndows. Newtonville, MA: The Charles J. Connick Stained Glass Foundation. Retrieved June 26, 2010. 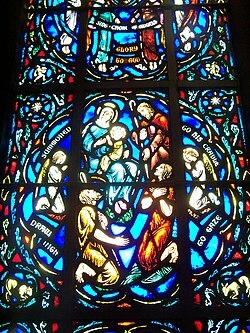 ^ "St. John's Cathedral History: Cathedral Windows – Overview". Albuquerque, NM: The Cathedral Church of St. John. Archived from the original on September 8, 2006. Retrieved November 19, 2009. ^ "Westminster Architecture". Buffalo, NY: Westminster Presbyterian Church. Retrieved November 19, 2009. ^ "The Stained Glass Windows of Pine Street Presbyterian Church and Their Restoration: Militant Christianity". Pine Street Presbyterian Church. Retrieved November 12, 2009. ^ "Armstrong Browning Library: Martin Entrance Foyer". Waco, TX: Baylor University. Retrieved November 19, 2009.